Victor 32-Piece Tire Toolkit | BUDK.com - Knives & Swords At The Lowest Prices! Stay safe - never leave home without it! 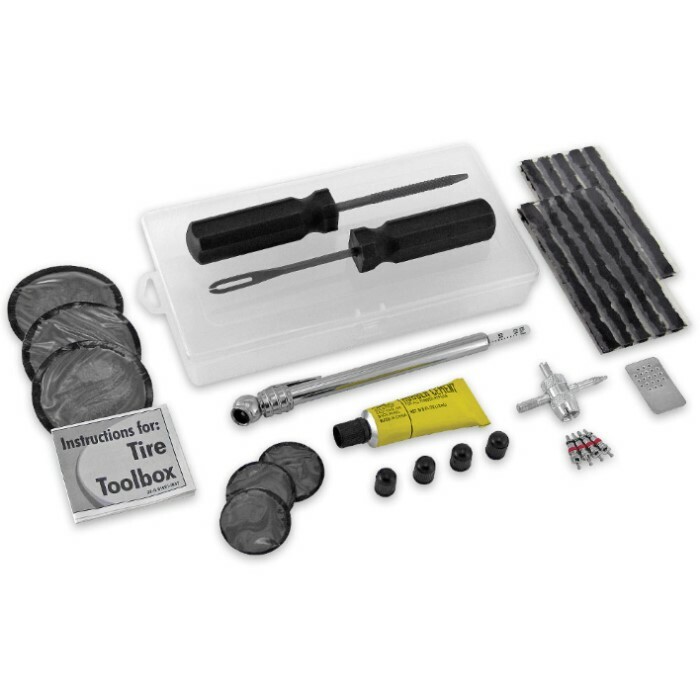 Victor's handy 32-Piece Tire Toolkit includes practically all the the tools and parts you'll ever need for complete tire repair and maintenance. Best of all, it comes in a convenient carry case for easy storage and transport. Place one in your car's trunk or truck toolbox. Don't forget bicycles, ATVs, motorcycles, lawn mowers and anything else with tires! Keep one of these versatile kits in your garage, shed, barn or anywhere else you store wheeled vehicles. Thankfully, with our incredible low prices it's easy! The Victor 32-Piece Tire Toolkit also makes a great gift for college students, cyclists and anyone else who travels on tires - practically everyone, in other words! Includes a pencil tire gauge, straight handle insert and rasp tools, 4" black tire plugs, 3/8 oz rubber cement, metal buffer, six patches, 4-way valve tool, four valve cores, four plastic valve caps, instruction booklet and compact carrying case.